In reality President Poroshenko sacrificed Ukrainian soldiers because he did not want to incur the wrath of the war party in Kiev by ordering their retreat. 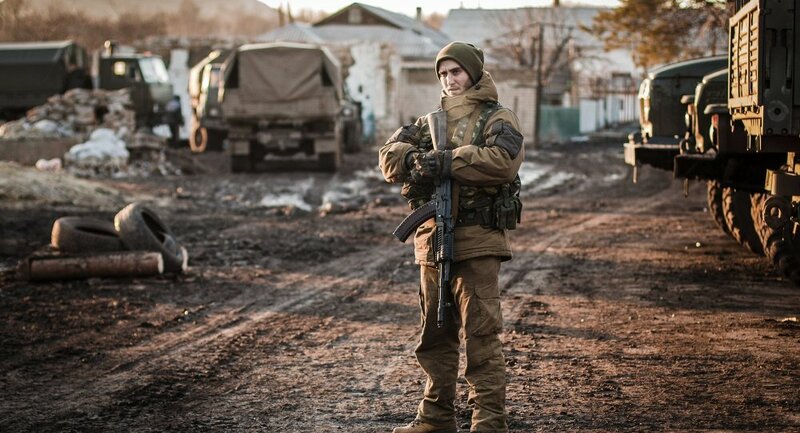 The debacle of the Ukrainian army in Debaltseve is a tragedy obscured by farce. Control of Debaltseve was important to the east Ukrainian militia. As a key railway junction it interfered with communications between the two rebel republics of Donetsk and Luhansk. It was also an obvious launch pad for a new government offensive aimed at cutting the militia controlled areas off from each other. It is impossible to see how Debalsteve was comparably important to the Ukrainian government. The very things that made Debaltseve important to the militia guaranteed that in the event of renewed fighting the militia would aim to capture it. A glance at the map shows why in that event, given the balance of forces, it was indefensible. So it proved. By Monday 9th February 2015, even Western journalists were admitting the militia had encircled Debaltseve and the Ukrainian troops there were cut off. The Ukrainian government however denied it. The denial reached farcical levels during the negotiations in Minsk. Half the 16 hours of negotiations were reportedly taken up with attempts to get Ukraine’s President Poroshenko to admit the obvious, that his troops in Debaltseve were encircled. Ukrainian President Petro Poroshenko refused to do so, refusing to order his troops to retreat and rejecting all offers from others to arrange this. There is no logic behind this denial of reality. No military objective was achieved by continuing to defend Debaltseve when its capture by the militia was just days away. As commander in chief President Poroshenko owed it to his men to agree the terms of their withdrawal when it was clear their further sacrifice was in vain. At an earlier stage in the war militia commander Strelkov withdrew his men from Slaviansk when it had become clear Slaviansk was undefendable and that no purpose was served sacrificing the lives of his men defending it. That is the basic duty owed by every commander to his men. President Poroshenko failed in that duty. The result is scores of Ukrainian soldiers (thousands by some counts) who might be alive are now dead. Some of the blame must lie with German Chancellor Merkel and French President Hollande. A report published by Der Spiegel confirms that they launched their peace initiative in part in order to save the lives of the Ukrainian soldiers trapped in Debaltseve. Given that this was so, they owed it to these trapped men to make President Poroshenko face reality and see sense. When he threatened to storm out of the meeting they should have called his bluff by warning him that if he did so they would put the blame for the failure of the talks on him. Had they done so, it is likely he would have come round. The main responsibility for the debacle must however lie with President Poroshenko. Not only did his refusal to face reality doom many of his soldiers to certain death but ludicrously, following the disaster, he has declared victory, claiming his soldiers’ sacrifice was necessary to “prove” to the Western Powers the Russian military’s involvement in the war. This is preposterous. Not only does the disaster do no such thing. What Poroshenko was “proving” is no more than what the Western powers have always been saying. He did not need to sacrifice his soldiers to “prove” it to them. In reality President Poroshenko sacrificed his men because he did not want to incur the wrath of the war party in Kiev by ordering their retreat. When a commander sacrifices his men for such a reason he has failed in his duty and it is time for him to go.